When I developed the Reclaimed Rose philosophy, I wanted to base the purpose of the store on taking a second look at discarded items and rethinking their purpose and their appearance. So often things are thrown away and replaced with items of a lesser quality. Customizing and personalizing things for people is a passion of mine and I am always looking for new materials to make beautiful again. As my own personal preferences developed, I decided to focus on my three favorite things: upcycling + paper + fabric. Most of my personal creations have one or more of these three elements. I decided to dedicate most of my time to creating items I love and I found other local artisans to "fill in the blanks" within the shop in order to be able to provide our customers with a vast array of locally handmade goods. Thus, Reclaimed Rose found its identity as an artisan collaborative. Reclaimed Rose products are a hodgepodge of old and new items, up cycled into unique display pieces. The style includes flirty and feminine, bohemian and gypsy, modern and chic, old and rustic and free spirited and whimsical. 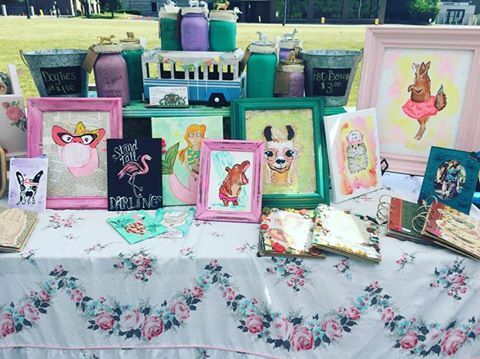 Each piece is hand selected and altered to create a trendy one-of-a-kind item. The majority of items are hand made or hand altered. I strive for extremely high quality and work hard to make pieces that will last for years to come. However, being that these are hand made and are not massed produced pieces you would find in a department store, there is a margin of error and sometimes items need to be handled with a certain degree of delicacy. I try to make these handling instructions clear before purchase by listing them on tag labels. If you have any questions on the care and/or handling instructions of an item, please do you hesitate to contact the shop. 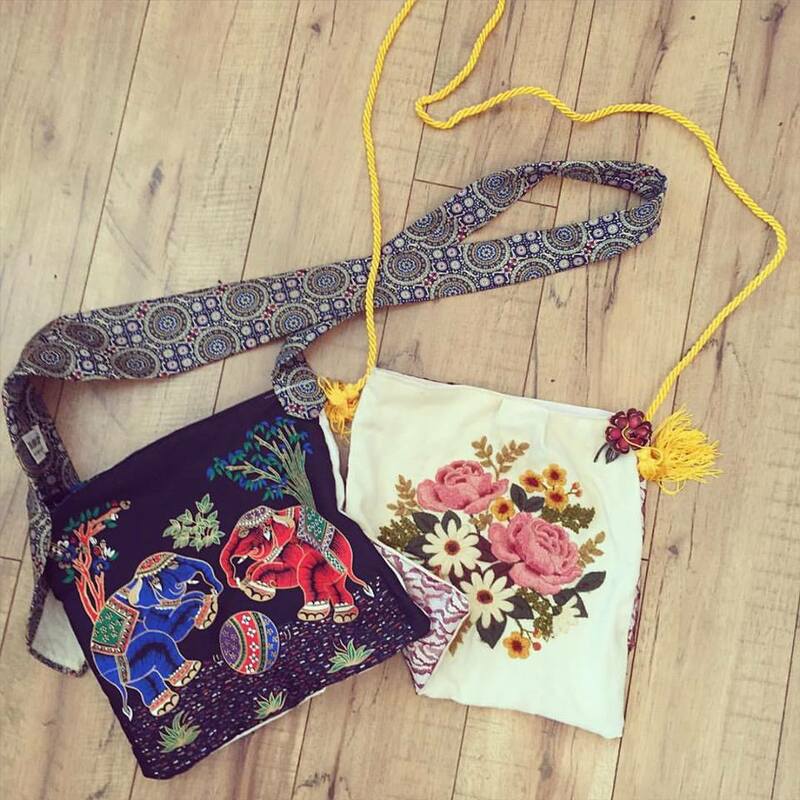 Handmade Market Bags - a mix of vintage textiles and trimmings (such as lace, tablecloths, bedspreads, curtains, clothing, doilies, etc..) and new fabric materials. I add vintage buttons, brooches, men's neck ties, fabric flowers and more to make each one unique. I am now branching out to cross body bags and lunch sacks. Mixed Media Journals - I love paper and ephemera. I also art journal and teach art journaling at my shop. However, a lot of people tell me that they have a hard time getting inspired to start art journaling. So, I took vintage Reader's Digest books and added mixed media - everything from 1960's newspaper, to black and white photos, to monopoly and bingo game cards, to 1920s sheet music and more. This give the artist a starting point for the creative process. Upcycled Clothing - Since I was a young girl I loved "deconstructing and reconstructing" clothing. From adding a unique trimming, lace overlay or incorporating a vintage fabric into a modern design, I enjoy creating one of a kind fashions. Lately, I have been focusing on creating redesigned men's button downs and flannels. Since plaid is a huge trend right now, I am loving mixing and matching the colors with prints and pairing these super comfy shirts with leggings! I also offer custom orders, so you can incorporate an old t-shirt with one of your husband's retired button downs for a completely one of a kind (uniquely you) piece! Mini Pillows - I love all things miniature and I love up cycling. So, I decided to create mini pills from up cycled sweaters, which I have needle felted designs on to. I also create mini pillows that can be used as ring bearer pillows. A lot of my wedding items are made from burlap coffees sacks or pretty vintage floral fabrics and adorned with doilies, brooches and more. Embellished Items - I love using old costume jewelry and found objects on my creations. I use them to embellish mini journals, 5X7 journals and drawing books and picture frames. I am constantly looking for trinkets and baubles to take something from plain to amazing. I use items such as old coins, buttons, wood cutouts, old game pieces, brooches and jewelry, seashells and sea glass, silverware and more! 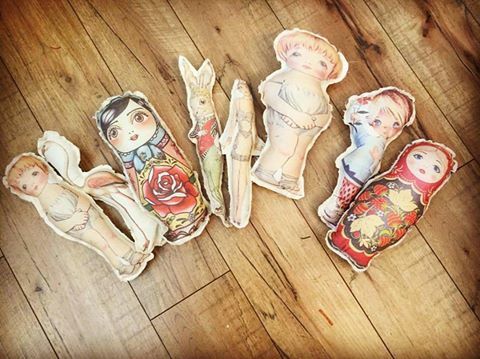 Vintage Inspired Fabric Dolls - I absolutely love old rag dolls and collect them whenever I can. My passion for these dolls led me to my little rag doll creations. These are little decorative stuffs based off of vintage images. Some images I find on old greeting cards, posters and post cards. They are a whimsical and unique gift item for a child, or a nostalgic adult. Handpainted Artwork - I use a combination of acrylic, watercolors and ink for my artwork. I also love reusing old up cycled frames to really compliment the work. You will find that all of my paintings have a whimsical and feminine look to them. Some of my favorite subjects are animals, girls, mermaids and sea life, birds, tribal, and modern calligraphy quotes. Vintage Picture Frames - I love mixing my own chalk or milk paint and experimenting with color to give new life back to old picture frames. Sometimes I add pictures or other media back into the frame (usually vintage pictures), or sometimes I just leave the empty frame itself. I love empty frame vignette accent walls. Hair Accessories - Another passion of mine is whimsical, handmade hair accessories. This includes headbands, hair clips and elastics. I love using vintage fabrics to create yo-yos and fabric flowers, or fabric wrapping headbands. I also sew turbans and elastic headbands. These are just a few of the many many things I make at Reclaimed Rose. I do a lot of items by custom order, so if you see something you would like me to make specific to your liking, please let me know.